So "Wedding" is definitely not the first word that comes to mind when you think about Sam's Club. Honestly, you probably think of a gallon of pickles or bulk processed cheese products. Definitely not floral arrangements. But here's a budget surprise: Sam's Club sells beautiful wedding bouquets! And no, they won't just ship you boxes of flowers to arrange yourself (although they do totally do that). These flowers are sold in collections already made into beautiful bouquets, boutonnieres, corsages, and even centerpieces! Now what is included all depends on what package size you get. 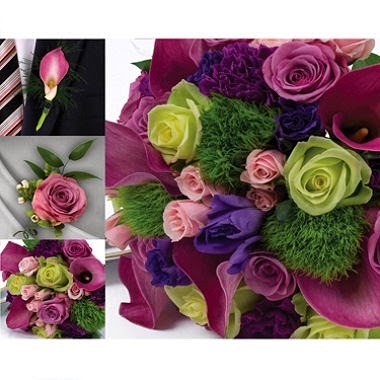 There are 2 piece and 3 piece bridesmaid bouquets, and corsage/boutonniere collections of different sizes. 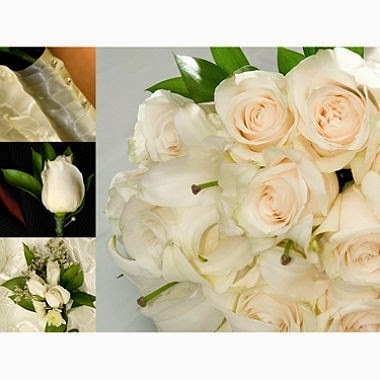 10 piece collections including 1 Bridal bouquet, 2 Bridesmaid bouquets, 4 Boutonnieres, and 2 Corsages. 17 piece collections include 1 Bridal bouquet, 4 Bridesmaid bouquets, 1 Toss away bouquet, 6 Boutonnieres, and 4 Corsages. 23 piece collections include the 17 piece collection PLUS 6 Centerpieces. 33 piece collections include 23 piece collection plus 4 more Boutonnieres and 6 more Corsages. 43 piece collection includes 1 Bridal bouquet, 6 Bridesmaid bouquets, 1 Toss away bouquet, 10 Centerpieces, 12 Boutonnieres, and 12 Corsages. All collections come with boxes of flower petals, clippers for the ends of the flowers, and care instructions for all pieces. There are 16 different floral collections at Sam's Club, ranging from $313 to $689 for the 17 piece collections. Wedding Collection - Green & White - 17 pc. 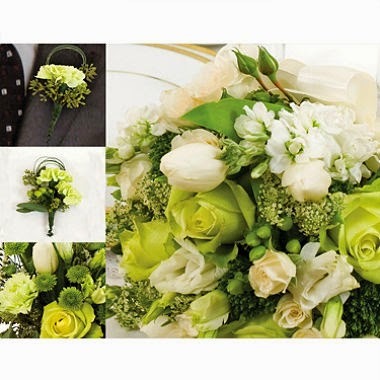 Flowers used: Green roses, white stock, white lisianthus, white spray roses, white tulips, green hypericum, Queen Annes lace, green trachelium. Wedding Collection - Bright - 17 pc. Wedding Collection - Earth Tone - 17 pc. 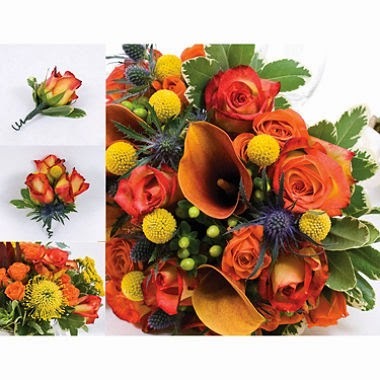 Flowers used: Yellow/red bi-color roses, mango mini calla lily, orange spray rose, blue eryngium, green hypericum, variegated pittosporum, yellow crespidia, yellow protea pincushion, baby blue eucalyptus. Wedding Collection - White - 17 pc. Flowers used: White roses, white oriental lily, ruscus, white stock, white limonium, button poms, and variegated pittosporum. There will be a 10% charge on floral arrangements if you do not have a club membership. By using the links that I have provided you can receive a $10 gift card just for joining! 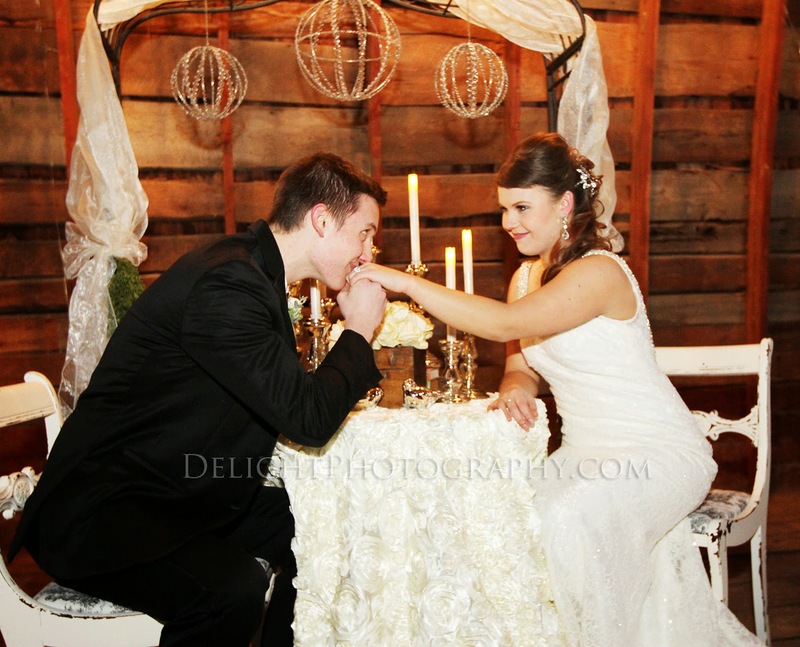 Follow Bargain Bridal Hunter's board Sam's Club Floral Collections on Pinterest.